°o° Disney’s Boardwalk Inn is a Deluxe Resort located on Crescent Lake in between Epcot and Disney’s Hollywood Studios, a later addition to the Inn is Disney’s Boardwalk Villas which are a part of the Disney Vacation Club and a Disney Deluxe Villa resort. This resort evokes the memories of 1940s Atlantic City. 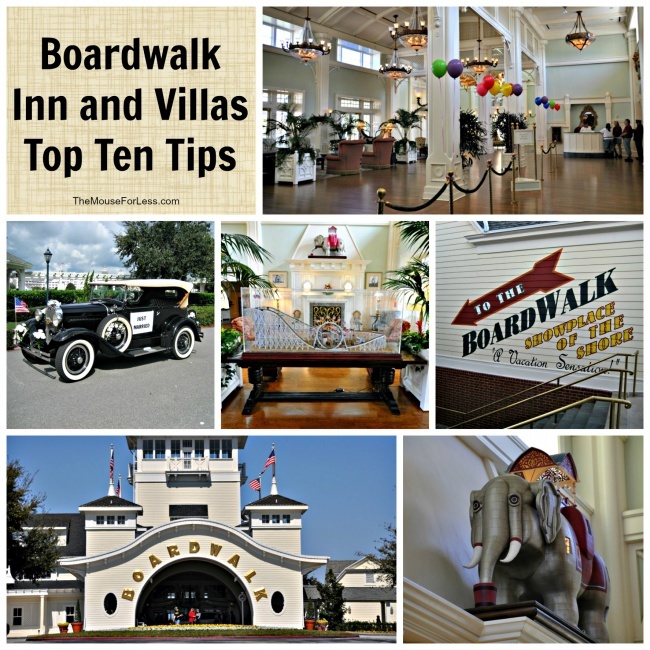 °o° Enjoy reading these Boardwalk Inn and Villas Top Ten Tips collected from our Mouse for Less family. Enjoy the pools: Our first of the Boardwalk Inn and Villas Top Ten Tips is to take time to enjoy swimming or just relaxing at the Luna Park Pool. Keister Coaster is a 200-foot water slide themed as a wooden roller coaster. In addition there are 2 quiet pools for a lounge chair nap or a good book reading spot, one located near the Villas and one near the Garden Suites. You are close enough to Epcot or Disney’s Hollywood Studios for an afternoon dip to cool off. It’s a great way to relax in between morning and evening park visits. There is also a playground available for the little ones byt the Luna Pool as well as bar for snacks and beverages. Bellevue Lounge: This little known venue is tucked away on the upper floor of the Boardwalk. They offer breakfast options (in case you have had your fill from the Boardwalk Bakery) as well as adult beverages later in the day. The Bellevue Lounge is a great place to tuck in and relax. Community Hall: These great spaces are available at all Disney Vacation Club resorts, but available to all guests staying at the resort. Check their schedule for fun and games at the pool, craft activities (some are free, some involve a fee), movie and game rentals as well as some gaming systems and game tables in the hall. Explore delicious dining options: There are some great dining options, like Big River Grille, Trattoria al Forno and Flying Fish Cafe, but the Disney’s BoardWalk Inn and Villas are only a short walk away from dining at Disney’s Beach Club and Yacht Club Resorts, too. You will also find the ESPN Club. With over 25 satellite feeds and over 40 monitors, there is certain to be something to fit every sports lover’s interest. Plus there is a fully functional studio, so you may even catch a live interview. Groceries: Do you need a few basic groceries? Check out the Screen Door General Store. They typically carry cases of bottled water and distilled water in gallons, as well as many other necessities. Plan for an evening on the BoardWalk! If you are looking for a place for your kids to have fun while you enjoy the nighttime on the BoardWalk, why not reserve them a spot at the Sandcastle Club at Disney’s Beach Club (additional charge)? Check with your schedule you received at check in, or at the front desk for night time activities. Jelly Rolls and Atlantic Dance Hall are fun options in addition to the outdoor entertainment. Take a spin on the water or take a bike ride on the BoardWalk: Rent a watercraft at Bayside Marina for an afternoon of fun or rent a bike or surrey to ride along the BoardWalk. Boardwalk Inn and Villas Top Ten Tips tip – do your bike ride in the evening so it’s not quite as hot. Wrap it up with a pizza on the Boardwalk from the pizza take out window. It is especially thrilling for those of us from up north to be able to sit outside and eat pizza during the winter months. Catch a Movie Under the Stars: Our last of the Boardwalk Villas Top Ten Tips is to check the schedule and relaxing while enjoying a nightly “Movie Under the Stars” by the Luna Park Pool.